I really enjoyed ‘Startup Communities’ and I really think it can add huge value to anybody looking to help create a vibrant Startup Community in their own city. Since I really enjoyed Venture Deals, I was curious to read more books by Brad Feld. So I started ‘Startup Communities: Building an Entrepreneurial Ecosystem in Your City’ hoping for more insight on the startup ecosystem. I was not disappointed; the book also further inspired me to part of this world in the future. The book uses the history of Boulder, Colorado in the United States as the premise to describe a startup community. Feld refers to it as “The Boulder Thesis”. My perception from afar has long been that the tech startup world starts and ends almost exclusively with Silicon Valley. Well, that assumption has been properly crushed! In fact, this book paints such a great picture of Boulder that I feel the need to go see what it is like for myself. 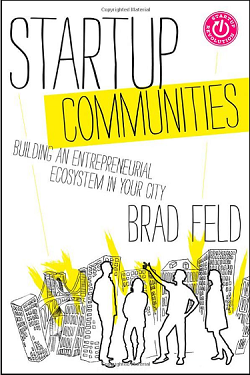 Feld makes a very strong case that a startup community needs to function as a bottom up inspired community that is led by entrepreneurs. If any other players in the ecosystem, like governments, lawyers, universities or venture capital firms (whom Feld refers to as followers) take a leadership role, the growth of the startup community will be throttled. When Marisa Mayer recently took over as CEO of Yahoo, I was intrigued that Google did not have some form of non-compete or restraint agreement as part of her employment contract that would prevent her from going to a competitor. This book provided me an answer to this question: Non-Compete agreements are unenforceable in California. This seems to be one factor that helps to drive the health of the entrepreneurial ecosystem in Silicon Valley. The book also addresses one of the commonly perceived problems in many startup communities: the lack of Venture Capital. Since there will always be some imbalance in the supply and demand for startup capital, it is very important not to see venture capital and startup communities as the same thing. In today’s connected world capital increasingly will find worthy ideas to invest in no matter where they are located. I really enjoyed ‘Startup Communities’ and I really think it can add huge value to anybody looking to help create a vibrant Startup Community in their own city. I hope the leaders in Silicon Cape reads ‘Startup Communities’. This entry was posted in Book Reviews on 2012/12/02 by Justinus.